Reinbeck bei Hamburg: Rowohlt Taschenbuch Verlag, 2001. This is a reissue of the fourth edition of Das Tabu der Totengeister (published in 2000). It is nearly identical to that edition. The Ghostway is the sixth book in Tony Hillerman's Navajo Mystery Series and the third novel featuring the protagonist Sergeant Jim Chee of the Navajo Tribal Police. This edition is published by Rowohlt as part of their RoRoRo thriller series. The title translates as "Taboo of the Spirits (or Ghosts) of the Dead." The text was translated by Klaus Fröba. 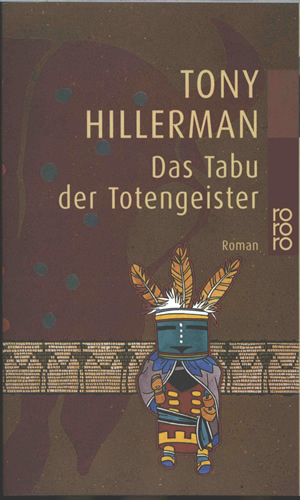 The cover, designed by Jürgen Mick, features a kachina figure wearing feathers and a serape in the foreground, printed in full color. Behind the figure is a drawing of a beaded band, with a beige background and human figures holding hands in brown. The overall background is an opacified drawing of half of a bison face with an empty eye socket and colored dots superimposed. The background is a brownish red, with a synopsis of the novel printed in off white. The vertical rororo logo, bar code, and price are also located on the back cover. The inside front and inside back covers are bright teal blue, with no printing or marks.